Convivium, in Latin, means “conviviality”, which is the sharing of good food and conversation with kindred spirits. Convivium is an old tradition here at Villa Silj It began in the 1st century AD when Emperor Augustus, built his country villa, here: Villa di Livia. Then, in the 19th century, 14,000 hectares were purchased by our family, Silj, Marquises of Sant’Andrea di Ussita and a great farming estate was created. We produced cheese (from both cow and sheep milk), milk, poultry, lamb, corn, fruit, vegetables and wine. Bread was home-made and so was butter, mayonnaise and tomato sauces for the pasta. In 1948, after the war, my uncle Pio Silj began to patronize a group of artists – known as the Convivium Romanum – who met at Villa Silj, to paint, eat, talk about art and a brighter future. Many of their works still hang on the walls of the villa. One picture in the dining room shows Pio’s wife Oddina – the redhead – sitting pensively at the dining table. “23,16 hours the Marchesa Silj, is busy elaborating a menu for her artist friends for tomorrow, first Sunday of May 1950: dry antipasto ? 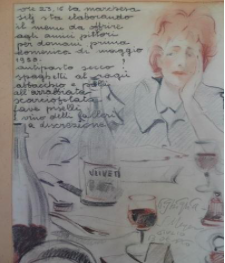 spaghetti with ragout, lamb and chicken arrabbiata, rumble-tumble artichokes, broad beans, peas and Falleri wines, ad libitum.” The picture is signed by Paulo Ghiglia, S. Meyer, Giulio Boetto. The Convivium tradition continued, when we came to live here in 1988. I gave it a strong extension into storytelling. For how could food and conviviality be separated from storytelling? And again: what is myth if not the prime human interpretation of nature and the prime human intuition about nature, its elements, its phenomena ? We have watched our guests dine on tales of heroes and legends. Then came my work “The Garden of Lemniscati”, which is a book “cultivated like a garden”, a garden “written like a book”. Here so many myths and magic of elements – corn, wine, olive oil, cheese, pomegranate, barley, fennel – accompany the stories. We imagined ancient men and women, sitting round fires, telling tales about animals, plants, seasons, dreams, phenomena, all enveloped in a vast spirit world. So much has been happening in Italy’s food and wine world, in recent years – just consider the Slow Food movement and Eataly - which have contributed to make Italy a world leader in food culture. This property – Villa Silj – together with Storygardenz - has contributed with its interest in food as individual elements (ELEMENTA) (*1), in ethnobotanical lore (*2) and in CONVIVIUM (conviviality) the art of sharing good food and good conversation with fine kindred spirits. Elementa is about food elements, the best prime ingredient which retain their identity on a plate. This means diversity, identity, seasonality and a preference for local production (km. Zero). Elementa in Italian cookery reign supreme – artichokes, fava beans, pecorino cheese, truffles. Thee implication being not only goodness and taste but most of all health. is highly reduced when grown out of season, in hot houses. Hence the importance of freshness, locality and seasonality. Elementa also implies light cooking and light seasoning– with few heavy sauces – so that their individuality may shine out. Misticanza (wild meadow grass salad) is a good illustration of what elementa means. Most people look at a meadow and say: “it’s a field of grass” but, in reality, it is a vast and magnificent ecosystem, mostly edible to humans - chicory, escarole, dandelion greens, crunchy radicchio - Italians make salad out of it. Misticanza means "mystical mix" is about that ecosystem, art in nature; a reminder that life is bitter sweet. All the houses at Villa Silj are self-catering but we serve meals to our guests, when they require it. We do a fixed menu based on the best daily ingredients, in season and preferably from the local producers. We cook and season food lightly, with few heavy sauces, letting it to shine out, informal and authoritative. (*1) ethnobotany lore is about the observation of human-plant relationship, which can be experienced through geo-located stories arising from beliefs, myths, instructions, songs, art forms, rituals, recipes, and practices. Ethnobotany calls upon history, sociology, anthropology. Some of the psychoactive species and their lore carry us deep into realms of dream, ritual, mythology and cosmology. Take a hands-on cooking lesson here, based on our food and wine philosophy (see Food and Wine culture). Decide the menu, shop for the best ingredients, then cook together and enjoy the meal of our shared labour. With Gianpiero Presta of Vin@mor, selector of “miraculous” wines from all regions of Italy. Wine tasting events can take place in our garden or in Vin@more charming and atmospheric wine bar, near us. The food of Rome and Lazio is strong, intense, simple and genuine: gnocchi (potato dumplings with sauce), pasta Carbonara and Amatriciana, porchetta (delicious roasted pork), spring lamb, Trastevere tripe, oxtail stew (Vaccinara) and saltimbocca alla romana. And, for the Romans have a special relationship with the seasonal vegetables: Roman artichokes, fave broad beans, asparagus, misticanza (wild meadow grass salad) ….. In addition there is the famous Jewish Roman cuisine, for Rome has the oldest standing Jewish community outside Israel. Add to that, Lazio’s cookery has been experiencing a recent cross fertilization from other Italian and Mediterranean regions. It is very exciting. We can organize gastronomic tours both in ancient Roman and Jewish gastronomic lore and also contemporary Roman fusion. First courses: orecchiette patate and ruccola * penne alle erbe * lasagne or baked pasta (with radicchio-chicory, vegetable or meat) * crepes * minestrone with garden vegetables * eggplant parmigiana with black chocolate. Main courses: pasticcio with potatoes, prosciutto (Parma Ham) and cheese * torta rustica * pork with prune and apple sauce * pollo agli agrumi o limone (chicken with citrus or lemon * polpettone * Guinea fowl with black olives. All main courses are served with fresh vegetables and salads, especially misticanza (mixed leaf and meadow grass- see notes above). Sweet: crostata * torta di mele * tiramisù * mousse * fruit gelato or Sicilian gelato with cream honey saffron and orange peel * Chilled melon/water melon on hot summer nights. Other: espresso coffee * mineral water * bread * organic house wine (red and white) superior wines are extra (see below). Fresh bread. Children specials: Well, here, the aim is to keep children happy – which makes the parents happy: a single main course of what children “like” (pasta with fresh tomato and parmesan / hot dogs / hamburgers / roast chicken / chips), accompanied by something parents “like” (fresh salads / fresh vegetables). Dessert follows (typically gelato). Wines: If you enjoy wine, you should know about our associates Vinamor, a very gifted wine selecting team. They seek small hidden, secret, vineyards around the Italian peninsula. You won’t be able to find these wines in supermarkets because their production is not great enough and tends to be sold to private buyers, like us. You will be astonished at their quality, with prices very affordable. Wine perfectly embodies Italy’s bewildering talent, bio-diversity and ethno-botanical lore. Full bodied red: Cellaro “Luma Syrah” (Sicily- or similar) accompanied by seasoned cheeses.